Following his qualification at the international Denturist Education Centre in Toronto, Canada and the introduction by the General Dental Council of a new classification of Dental Care Professional, the Clinical Dental Technician, Colin opened Bespoke Denture Centre in 2001. The aim of Bespoke Denture centre was to provide complete dentures directly to the public and partial dentures on prescription from a dentist. 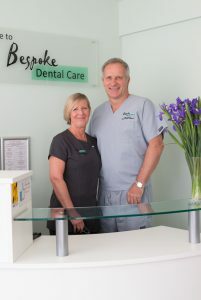 During this time Colin felt that it would be beneficial to offer a complete range of dental care to his patients and their families, by inviting a dentist to work along side him. In 2013, the Bespoke Denture Centre was completely refurbished in line with all current legislation and with his wife Carol, a retired Dental Surgeon with over 30 years experience, Bespoke Dental Care was formed. In October 2013 the Practice was inspected and gained initial registration with the Care Quality Commission. Dr Farzana Islam, an enthusiastic and dedicated dentist has joined Colin and their aim is to offer quality, competitively priced family dentistry.